I stopped by WBAL on Sunday morning to show how to make fun Star Wars crafts and decorations. I used items I had around the house along with inexpensive things I found at the craft store. I am so excited about the Force Awakens that I even wore my Darth Vader costume on set! I will be posting instructions and how to videos all week in anticipation of the new Star Wars movie! 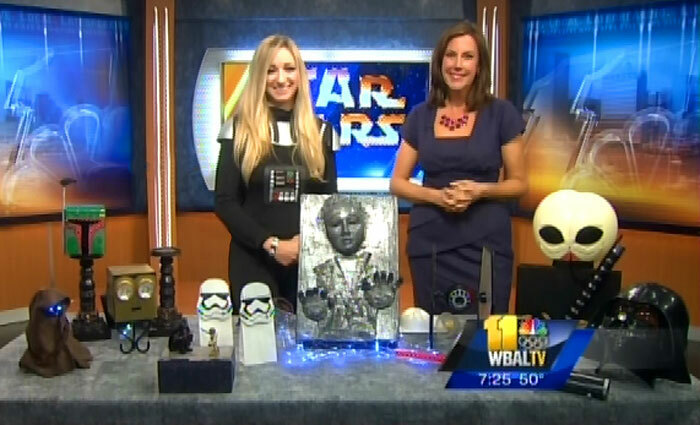 Here is my Star Wars TV Segment from WBAL NBC Baltimore. This entry was posted in Uncategorized and tagged bob fett, c3p0, cantina, cantina alien, Darth Vader, Gina Tepper, han solo, han solo carbonite, jaw craft, jawa, star wars, star wars crafts, star wars party, star wars patters, star wars the force awakens, storm trooper, storm trooper gift bags, wbal. Bookmark the permalink.